The Middle East is one of the fastest growing and significant markets in world sport, as well as a powerful source of investment in sport. Bids for the Olympics in 2020 and the soccer World Cup in 2022, as well as remarkable investments in Formula One motor racing, horse racing and English Premier League soccer clubs, demonstrate the strength of interest, the depth of resource and the technical expertise maintained by sport business interests in the region. 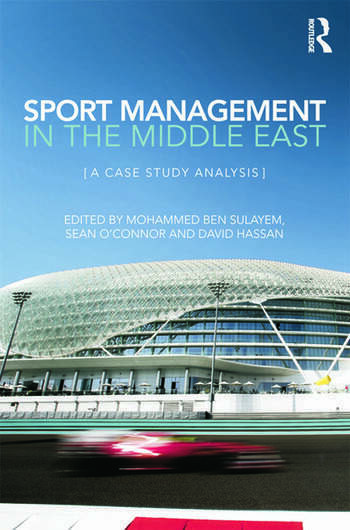 Sport Management in the Middle East is the first book to offer a serious and in-depth analysis of the business and management of sport in the region. Written by a team of world leading researchers in Middle Eastern sport, and illustrated in full colour throughout, the book examines the importance of sport in the Middle East and introduces its particular management processes, structures and cultures. As well as providing an overview of the region’s sporting strategy and key stakeholders, the book also offers a number of detailed case-studies of sport in individual Middle Eastern countries. A unique guide to sport management in a region of fundamental importance in world sport, this book is essential reading for any serious student or scholar of sport management, sport business, Middle East studies, or sport and society. Mohammed Ben Sulayem is one of the most famous and successful sportsmen in the Middle East. The UAE national was a winner of a record 14 Middle East Rally Championships and competed with success at World Championship level. He is also a Vice President of the Federation Automobile International (FIA) the global governing body for motorsport including Formula 1. He has an intimate knowledge of sport management within the Middle East (and indeed globally), combining is scholarly contacts combined with practical engagement in the field. Sean O'Connor has an established research publication record in the field of sports management. He has lectured at a number of universities in the Republic of Ireland, including University College Dublin, and Dublin Institute of Technology. A Doctoral candidate at University of Ulster he has over twenty five years professional experience in the marketing and communication of sport in particular in the Middle East region. He holds an MPhil from DIT and a MA in Political Communications from DCU. He is also a Director of the Automobile and Touring Club of the UAE reporting to its President Mr. Ben Sulayem. He was a member of the organizing committee of the inaugural Abu Dhabi Formula 1 Grand Prix that won the award for the best Grand Prix in the 2009 world championship. David Hassan is a Senior Lecturer at the University of Ulster, Jordanstown. He is the Academic Editor of Sport in Society, an international, peer-reviewed journal (Routledge) and Series Editor of Foundations in Sport Management (with Dr Allan Edwards), a new Routledge book series beginning in 2010. He is a holder of a Distinguished Research Fellowship from Ulster in recognition of his outstanding contribution to research and in 2008 was appointed as an International Scholar with the International Football Institute in England. He is the editor of seven academic books on sport studies, has published over 50 scholarly articles in peer reviewed journals/edited books and has presented at international conferences around the world.